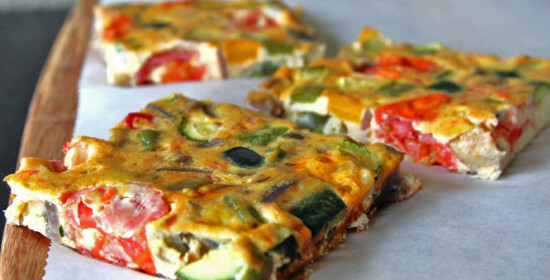 Vegetable Frittata Recipe Paleo. Colorful addition to Sunday brunch. Easy recipe is great to take on the go and reheat. Contains no cheese, milk, or cream. Wash all the vegetables then chop the onion, bell peppers, zucchini and cut the cherry tomatoes into fourths, slice the mushrooms, and the chili pepper into rings. For a little spice use the chili pepper. For a spicier frittata, mix the seeds and membranes in. Heat the safflower oil or other oil suited for high heat cooking in a cast iron skillet if you have one. Otherwise, substitute with any skillet and a casserole dish. Add the onions and once they begin to cook add the mushrooms and all the peppers. Mix well and saute for a few minutes then add the pressed garlic and the zucchini. Saute for a few minutes more than add the tomatoes, sautee for another minute then remove from the heat. In a large mixing bowl, crack the eggs and whisk until light and fluffy. Add the eggs to the cast iron skillet and put it in the oven. Bake the frittata for 15-20 minutes until lightly browned around the edges and the egg mixture in the middle is set and no longer wet. OR grease a 9 x 12 inch casserole dish liberally with extra virgin olive oil then pour the frittata mix into it and bake. Remove frittata from oven. If using the skillet, cut the frittata into pie shaped wedges. If using the casserole dish, cut the frittata into evenly sized rectangular pieces. Arrange sliced frittata on a decorative dish, and serve or if serving for a brunch you can leave the frittata in the skillet or casserole dish. NOTE: using a cast iron skillet is the traditional method of cooking a frittata and will give you pie-shaped wedges. Using a casserole dish will give you rectangle shaped pieces as pictured. 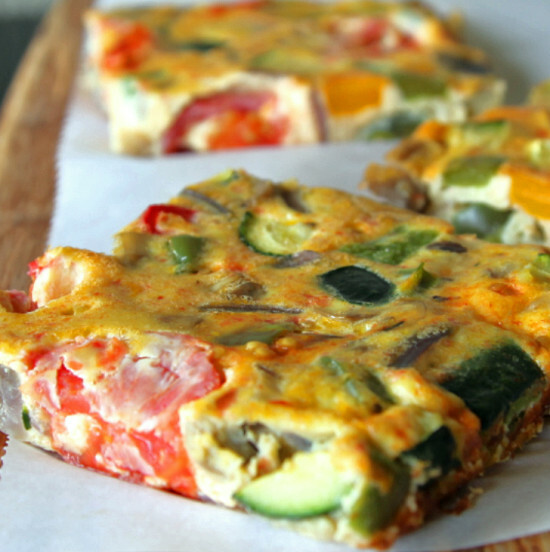 Metatags – Vegetable Frittata Recipe Paleo. Colorful addition to Sunday brunch. Easy recipe is great to take on the go and reheat. Contains no cheese, milk, or cream.